We run a number of kids clubs at the Climbing Station. Through these sessions, young climbers are coached to become skilled and enthusiastic climbers with a life-long love of the sport. No previous experience is required. Our Gibbons club is a fun, instructor lead session lasting 90 minutes. The children have the opportunity to climb the roped walls as well as bouldering. Ideal for kids aged 7 – 11. Our Academy club is a fun, instructor lead session lasting 90 minutes. The teenagers have the opportunity to climb the roped walls as well as bouldering. Ideal for kids aged 12+. ‘Little Monkeys’ is an hour long session designed for 4-8 year olds alongside mum or dad. We aim to introduce both parent and child to the wonderful sport of climbing through a mix of fun games and climbing challenges. 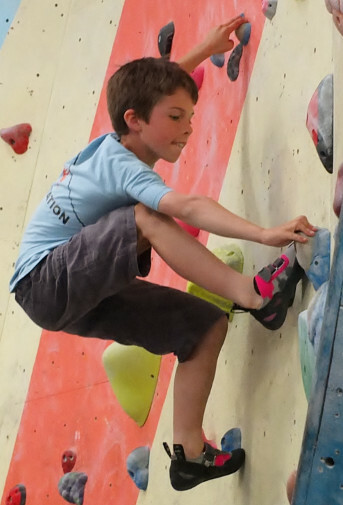 Through the school holidays, we run daytime climbing sessions for kids aged 7-16. These classes are perfect for both beginners and experienced young climbers. The Climbing Station is a primary centre for NIBAS (National Indoor Bouldering Award Scheme) meaning we can deliver the complete levels 1 to 5. We are also an accredited centre for NICAS (National Indoor Climbing Award Scheme) meaning we can deliver levels 1-3. Already registered for NIBAS/ NICAS? Follow this link for related resources.